This week I attended a great conference organised by the dairy council on milk and sport. The Dairy Council is a non-profit making organisation which provides science based information on the role of dairy foods as part of a healthy balanced diet and lifestyle. They organised a brilliant day which reinforced my ideas about milk in sport. In recent times I have been reading a lot about milk, mainly because it is a something I like to drink a lot, but also because of some recent good research from close friends and colleagues. After having read the recent evidence, I am still puzzled why in too many sports it has not become standard practice to introduce milk as a post workout drink. As I mentioned in my previous post, I like basics. So in this post I will explain why milk consumption is a good idea for athletes (unless one is lactose intolerant). First of all, what is milk? Milk is a white liquid produced by the mammary glands of mammals. It is the primary source of nutrition for young mammals before they are able to digest other types of food. Early-lactation milk contains colostrum. Milk is an emulsion or colloid of butterfat globules within a water-based fluid that contains dissolved carbohydrates. The largest structures in the fluid portion of the milk are casein protein micelles: aggregates of several thousand protein molecules, bonded with the help of nanometer-scale particles of calcium phosphate. Milk contains dozens of other types of proteins beside the caseins. They are more water-soluble than the caseins and do not form larger structures. Because these proteins remain suspended in the whey left behind when the caseins coagulate into curds, they are collectively known as whey proteins. Whey proteins make up approximately 20% of the protein in milk, by weight. The carbohydrate lactose gives milk its sweet taste and contributes approximately 40% of whole cow’s milk’s calories. Lactose is a disaccharide composite of two simple sugars, glucose and galactose. Milk in the UK (generally cow’s milk) is distinguishable by its fat content. Contrary to popular belief, lowering the fat content in milk does not affect the calcium content, so an adequate calcium intake can still be obtained from lower-fat dairy products. However, low fat milk contains less energy and lower amounts of fat soluble vitamins and isn’t suitable for children under two years. Some supermarkets have now started selling milk with a 1 % fat content which has almost half the fat of semi-skimmed milk but retains a more creamy flavor. This is a good option for those people who want to lower the amount of fat they’re consuming but don’t like the taste of skimmed milk. This is the nutritional value of common milk brands in the UK. It is unclear whether proteins from different sources induce a greater anabolic response after resistance exercise. Different milk proteins result in a different time course of hyper aminoacidemia (Boirie et al, Dangin et al.). Proteins, such as soy and whey, which are digested rapidly, lead to a large but transient rise in aminoacidemia, stimulate protein synthesis, and are referred to as "fast" proteins. By contrast, casein protein is considered a "slow" protein because it promotes a slower, more moderate, and longer lasting rise in plasma amino acids and does not stimulate protein synthesis, at least at the whole body level, but suppresses proteolysis (Borie et al). Many studies have suggested that, to promote an anabolic environment for muscle protein synthesis after resistive exercise, a supply of both fast dietary proteins, which stimulate protein synthesis, and slow dietary proteins, which suppress muscle protein breakdown, are recommended. Such a combination of fast and slow proteins is available in fluid bovine milk, which contains ≈80% casein and ≈20% whey protein by mass. In an elegant study, Wilkinson et al. (2007) compared the effectiveness of skim milk versus an isonitrogenous and isoenergetic soy-protein beverage in promoting protein accretion after resistance exercise. Both hyper aminoacidemia and resistance exercise have been shown to independently stimulate muscle protein synthesis. Further increases in muscle protein synthesis have been documented when combining resistance exercise with feeding. In this experiment, the authors recruited 8 subjects well experienced in resistance exercise. The subjects performed 2 trials in random order separated by ≥1 wk. On each trial day, the participants received either a soy or milk beverage after a unilateral resistance exercise bout. The subjects performed a standardized leg workout, i.e., leg press, hamstring curl, and knee extension with a single leg. The workout consisted of 4 sets of each exercise, with 10 repetitions per set for the first 3 sets, and the last set to exhaustion. Exercise intensity was set at 80% of 1 RM with an interset rest period of 2 min. After the resistance exercise protocol was completed, blood samples and muscle biopsy samples were obtained from the vastus lateralis. The subjects then ingested (in a randomized single-blinded fashion) a 500-mL drink that contained either fluid nonfat milk or an isonitrogenous, isoenergetic, and macronutrient-matched soy-protein beverage (745 kJ, 18.2 g protein, 1.5 g fat, and 23 g carbohydrate as lactose for milk and as maltodextrin for the soy beverage). The drinks were made from commercially available isolated soy protein (GeniSoy, Fairfield, CA) or skim milk powder. As we can see from the results below, drinking milk determined a larger increase in fractional synthetic rate of muscle proteins as compared to soy. Mean (±SEM) fractional synthetic rate (FSR) of muscle proteins during the resistance exercise time period (Exercise) and 3 h after exercise and the consumption of a nonfat milk-protein beverage or an isonitrogenous, isoenergetic, macronutrient-matched (750 kJ, 18.2 g protein, 1.5 g fat, and 23 g carbohydrate) soy-protein beverage (3 h Recovery). *Significantly different from the soy group at the same time point, P< 0.05. †Significantly different from Exercise, P < 0.05. n = 8. This happened despite the slightly larger increase in total amino acid concentration in whole blood caused by the soy-protein beverage. Mean (±SEM) whole-blood total amino acid (TAA) concentrations after the consumption of a nonfat milk-protein beverage (•) or an isonitrogenous, isoenergetic, macronutrient-matched (750 kJ, 18.2 g protein, 1.5 g fat, and 23 g carbohydrate) soy-protein beverage (○). However the chemical net balance of total amino acid remained higher with milk up until 180 minutes following exercise as compared to the soy-protein drink and there was also a greater area under the curve. Mean (±SEM) total amino acid (TAA) chemical net balance (NB) after consumption of a nonfat milk-protein beverage (○) or an isonitrogenous, isoenergetic, macronutrient-matched (750 kJ, 18.2 g protein, 1.5 g fat, and 23 g carbohydrate) soy-protein beverage (•). Inset: positive area under the curve (AUC) for TAA NB after consumption of the milk or soy beverage. The primary finding of the current study was that intact dietary proteins were able to support an anabolic environment for muscle protein accretion. The authors observed a significantly greater uptake of amino acids across the leg and a greater rate of muscle protein synthesis in the 3 h after exercise and milk-protein consumption than after soy-protein ingestion. There were no differences in blood flow or in insulin and blood glucose concentrations in response to the drinks. Additionally, the measured essential amino acid content of both proteins was not significantly different. So, overall, drinking milk was better than the soy-protein solution. Before this study, other authors suggested the potential for milk to be an “anabolic” drink. Elliott et al. (2006) had 3 groups of volunteers ingesting one of three milk drinks each: 237 g of fat-free milk (FM), 237 g of whole milk (WM), and 393 g of fat-free milk isocaloric with the WM (IM). Milk was ingested 1 h following a leg resistance exercise routine. Net muscle protein balance was determined by measuring amino acid balance across the leg. Their results showed that Ingestion of milk following resistance exercise results in phenylalanine and threonine uptake, representative of net muscle protein synthesis. These results suggest that whole milk may promote increased utilization of available amino acids for protein synthesis. In a recent review by Prof. Stuart Phillips (2009) various studies were summarised and showed that whey protein is more effective than soy and simply energy (as carbohydrate) in supporting muscle mass accretion with resistance training and that milk proteins (including whey) are better than carbohydrate alone. Resistance training–induced changes in lean mass in studies of subjects receiving supplemental protein sources. A total of 9 studies [1–9] are incorporated (n = 241 subjects for all studies; n = 223 men and 18 women) into the figure with protein supplements of either fluid milk (3 studies; n = 42 total subjects), whey protein (8 studies; n = 91 total subjects), isolated soy protein (3 studies; n = 51 total subjects), or carbohydrate (7 studies; n = 67 total subjects). Studies in which other components were included in the supplement (i.e., creatine or crystalline amino acids) are omitted from this analysis unless these compounds were present in all supplements, in addition to the protein source itself. All studies were at least 8 weeks in duration and up to as long as 16 weeks (mean 11.2 weeks). Mean gains in muscle mass as a result of resistance training and protein supplementation were as follows (means ± SD): milk = 2.7 ± 1.3 kg (range, 1.9–3.9 kg); whey = 2.9 ± 1.6 kg (range, 0.2–5 kg); soy = 1.4 ± 0.6 (range, 1.5–2.0 kg); and carbohydrate (CHO)/placebo = 0.9 ± 0.6 kg (range, 0.3–1.8 kg). The solid line represents the mean change in lean body mass in all of the studies with its accompanying 95% confidence limits (dashed lines). Rankin et al (2004) had previously shown that Milk was similar to conventional sports drinks in maximising the hypertrophic effects of resistance exercise. In their study, they had two groups; a sport drink group (CHO) and a milk group (MLK). The supplement given to the CHO group provided 5 kcals/kg body weight, 1.25 g/kg carbohydrate and electrolytes (Gatorade; Barrington, IL). The supplement given to the MILK group, low fat chocolate milk (Kroger; Cincinnati, OH), provided 5 kcal/kg body weight, 0.92 g/kg carbohydrate, 0.21 g/kg protein, 0.06 g/kg fat and the natural vitamins and minerals contained in milk. Beverages were served by the experimenters or personal trainers within five minutes following each workout. 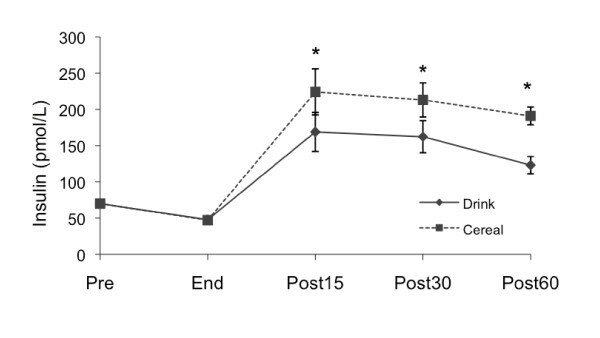 Post-resistance exercise consumption of MILK and CHO caused similar adaptations to resistance training after 10 weeks. Recent work from Kammer et al. (2009) compared the effects of ingesting cereal and nonfat milk (Cereal) and a carbohydrate-electrolyte sports drink (Drink) immediately following endurance exercise on muscle glycogen synthesis and the phosphorylation state of proteins controlling protein synthesis: Akt, mTOR, rpS6 and eIF4E. Trained cyclists or triathletes (8 male: 28.0 +/- 1.6 yrs, 1.8 +/- 0.0 m, 75.4 +/- 3.2 kg, 61.0 +/- 1.6 ml O2*kg-1*min-1; 4 female: 25.3 +/- 1.7 yrs, 1.7 +/- 0.0 m, 66.9 +/- 4.6 kg, 46.4 +/- 1.2 mlO2*kg-1*min-1) completed two randomly-ordered trials serving as their own controls. After 2 hours of cycling at 60-65% VO2MAX, a biopsy from the vastus lateralis was obtained (Post0), then subjects consumed either Drink (78.5 g carbohydrate) or Cereal (77 g carbohydrate, 19.5 g protein and 2.7 g fat). Blood was drawn before and at the end of exercise, and at 15, 30 and 60 minutes after treatment. A second biopsy was taken 60 minutes after supplementation (Post60). The results were quite interesting. A part from a marked difference in insulin response, no significant difference was identified in the phosphorylation state of proteins controlling protein synthesis. Milk as a recovery drink? Milk is an interesting drink, due to its composition and mixture of carbohydrates, proteins, fat and electrolytes. For this reason, it could be quite a useful rehydration solution and a recovery drink. My friends and colleagues (Shirrreffs, Watson & Maughan, 2007) at Loughborough university were the first group to suggest its effectiveness as a post-exercise rehydration drink when adding 20 mmol/l of NaCl. In their study they had 11 subjects with a randomised cross-over trial to compare different drinks. The drinks ingested during the experimental trials were milk (0·2 % fat; Tesco Ltd, Cheshunt, UK; trial M) and milk (0·2 % fat) with an additional 20 mmol/l NaCl (trial M+Na), water (Aquapura, Basingstoke, UK; trial W) and a commercially available carbohydrate–electrolyte sports drink (Powerade, Coca Cola Ltd, London, UK trial CE). Some of the results are below. Whole body net fluid balance over the course of the protocol ( ., trial W, water; ○, trial CE, carbohydrate–electrolyte sports drink; ▾, trial M, milk; ▿, trial M+Na, milk with added NaCl). Values are means with group standard errors depicted by vertical bars. a,b,c,d Mean values were significantly different from corresponding values in W, CE, M and M+Na trials, respectively (P < 0·05). Post-Ex, post-exercise; Pre-Ex, pre-exercise. Very interesting data on subjective feelings of thirst, fullness, bloatedness and hunger (a) and mouth taste, tiredness, alertness, concentration, headache, refreshment and energy (b) were reported during the course of the protocol.The subjects reported that the carbohydrate–electrolyte solution was sweeter (P = 0·001) and there was a tendency for it to be more palatable (P = 0·087) than the other experimental drinks. The authors concluded that milk is an effective solution to promote recovery following mild exercise-induced dehydration, compared to the ingestion of the same volume of either plain water or a commercially available sports drink, and can be considered for use after exercise by everyone except those individuals who have lactose intolerance. The naturally high electrolyte content of milk (Na 38 mmol/l; K 45 mmol/l; Cl 35 mmol/l) used in this study, aided in the retention of fluid and the maintenance of euhydration 4 h after the end of drinking, although differences in gastric emptying rates due to the presence of protein and fat in the milk could be discounted. 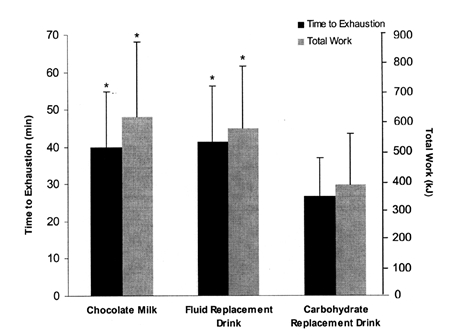 Further support to this idea of using milk as a rehydration solution or recovery drink came from recent work from the same group (Watson et al., 2008). Following a 2.0 +/- 0.1% body mass loss induced by intermittent exercise in the heat, seven male volunteers ingested either a carbohydrate-electrolyte solution (CE) or skimmed milk (M) in a volume equal to 150% of body mass loss. At the end of the 3 h recovery period, subjects were essentially in positive fluid balance on trial M (191 +/- 162 mL), and euhydrated on trial CE (-135 +/- 392 mL) despite being in negative sodium balance on both trials and negative potassium balance on trial CE. Despite the effect on fluid retention, exercise capacity was not different between skimmed milk and a commercially available carbohydrate-electrolyte drink 4 h following exercise/heat-induced body mass loss. In the same year, this group also showed that milk had similar effects to commercially available sport drinks on exercise capacity. Eight healthy males (age 24 +/- 4 y, height 1.76 +/- 0.04 m, mass 68.9 +/- 9.5 kg, body fat 12.5 +/- 2.4%, peak oxygen consumption 4.3 +/- 0.6 L/min) exercised to volitional exhaustion at 70% peak oxygen consumption on four occasions. Subjects ingested 1.5 mL/kg body mass of plain water, a carbohydrate-electrolyte solution, low-fat (0.1%) milk, or low-fat (0.1%) milk with added glucose before and every 10 min during exercise. Exercise time to exhaustion was not significantly influenced by the drink ingested (P = 0.19), but there was a tendency for subjects to exercise longer when the carbohydrate-electrolyte (110.6, range 82.0-222.7 min), milk (103.3, range 85.7-228.5 min), or milk plus glucose (102.8, range 74.3-167.1 min) was ingested compared with water (93.3, range 82.4-192.3 min). The solution ingested did not influence the cardiovascular, metabolic, or thermoregulatory response to exercise. One of my former students was involved in this study of James et al. (2011) aimed at studying the effects of milk protein on rehydration after exercise in the heat, via the comparison of energy- and electrolyte content-matched carbohydrate and carbohydrate–milk protein solutions. Eight male subjects lost 1·9 (sd 0·2) % of their body mass by intermittent exercise in the heat and rehydrated with 150 % of their body mass loss with either a 65 g/l carbohydrate solution (trial C) or a 40 g/l carbohydrate, 25 g/l milk protein solution (trial CP). The results of this study suggested that when matched for energy density and fat content, as well as for Na and K concentration, and when ingested after exercise-induced dehydration, a carbohydrate–milk protein solution was better retained than a carbohydrate solution. These results suggest that gram-for-gram, milk protein seems more effective at augmenting fluid retention than carbohydrate. Flavored milk has recently reached the shelves of many supermarkets. In particular chocolate milk and fruit-based milk drinks can be bought easily in most supermarket chains. 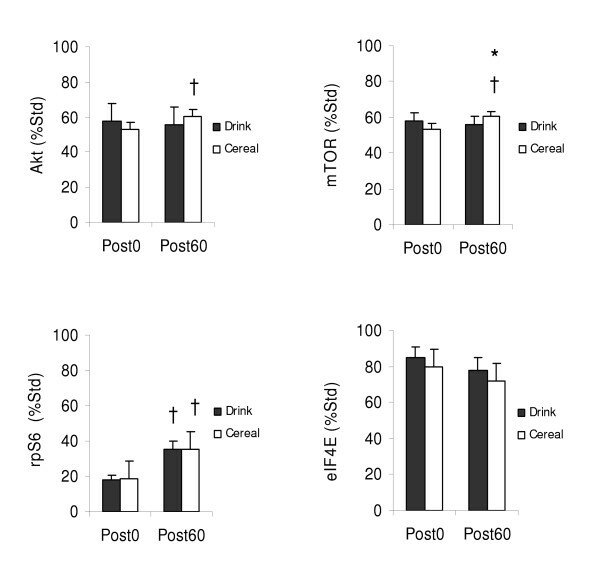 Some research activities have suggested the effectiveness of these milk-based drinks on recovery. Karp et al. 2006 studied the differences between isovolumic amounts of chocolate milk, fluid replacement drink (FR), or carbohydrate replacement drink (CR), in a single-blind, randomized design.Carbohydrate content was equivalent for chocolate milk and CR. Time to exhaustion (TTE), average heart rate (HR), rating of perceived exertion (RPE), and total work (WT) for the endurance exercise were compared between trials. TTE and WT were significantly greater for chocolate milk and FR trials compared to CR trial. The results of this study suggested that chocolate milk could be an effective recovery aid between two exhausting exercise bouts. Recently, Lunn et al. (2011) showed some exciting results.Male runners participated in 2 trials separated by 1 wk and consumed either fat-free chocolate milk (MILK) or a non-nitrogenous, isocaloric, carbohydrate control beverage (CON) after a 45-min run at 65% of VO2peak. Consuming MILK postexercise resulted in higher mixed muscle FSR with lower whole body proteolysis and synthesis compared to CON. Phosphorylation of eIF4E-BP1 and FOXO3a was higher for MILK, whereas Akt phosphorylation was lower during recovery regardless of dietary treatment. Enzymatic activity assays indicated lower caspase-3 activity during recovery for MILK and higher 26S proteasome activity for CON. Muscle glycogen was not affected by either dietary treatment; however, TTE was greater for MILK than CON. The authors concluded that the effects of consumption of fat-free chocolate milk following endurance exercise on FSR, signaling molecules of skeletal muscle protein turnover, leucine kinetics, and performance measures suggested unique benefits of milk compared to a carbohydrate only beverage. Ferguson-Stegall et al. (2010) have also studied the effects of chocolate milk on recovery and performance. In particular, in their study, they wanted to compare the effects of chocolate milk (CM), an isocaloric carbohydrate only supplement (CHO), and placebo (PLA) on markers of endurance exercise recovery and subsequent time trial performance in trained cyclists. Ten trained male and female cyclists (5 males, 5 females) performed 3 trials in which they first cycled for 1.5 h at 70% of VO2max, followed by 10 min of intervals that alternated 45% and 90% VO2max. They then recovered in the laboratory for 4 h, and performed a 40 km time trial (TT). The supplements were provided immediately after the first bout and 2 h into the recovery period. Treatments were administered using a double-blind randomized design. Chocolate milk provided during recovery was shown to improve subsequent time trial performance in trained cyclists more effectively than an isocaloric CHO supplement. The authors attributed this effects to a faster rate of muscle glycogen resynthesis with this drink. The same authors recently published the follow up work. This study compared the effects of a CHO + PRO supplement in the form of chocolate milk (CM), isocaloric CHO, and placebo (PLA) on recovery and subsequent exercise performance. Ten cyclists performed 3 trials, cycling 1.5 hours at 70% VO₂max plus 10 minutes of intervals. They ingested supplements immediately postexercise and 2 hours into a 4-hour recovery. Biopsies were performed at recovery minutes 0, 45, and 240 (R0, R45, REnd). The TT time was faster in CM than in CHO and in PLA (79.43 ± 2.11 vs. 85.74 ± 3.44 and 86.92 ± 3.28 minutes, p ≤ 0.05). Muscle glycogen resynthesis was higher in CM and in CHO than in PLA (23.58 and 30.58 vs. 7.05 μmol·g⁻¹ wet weight, p ≤ 0.05). This suggests that chocolate milk could be quite an effective recovery drink. The scientific literature seems to suggest that consuming proteins towards the end of a resistance exercise session could be beneficial for anabolism (for a recent review see here). 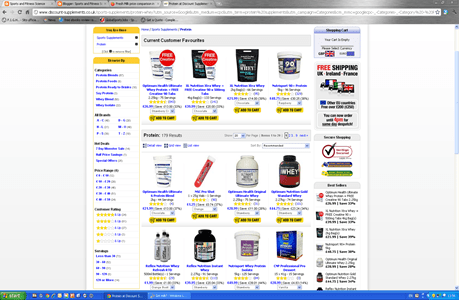 For this reason, protein supplements are probably the most used/sold supplements in sport. Unfortunately, they are also likely to be contaminated and cause banning from competition. Finally, they are expensive. I will give you some examples of costs. I have picked two random brands and website. no intention here to advertise or discredit any. Just doing the math. Cost is about 40p per drink. The protein content of such supplements is very high. And more is not always good. Recommended daily protein intake for athletes is suggested as a maximum of 1.7g x kgbm x day (see ACSM position stand). So for an 80Kg athlete the daily requirements would be 136g of proteins. The protein ingestion in one shot with the supplement would be therefore quite high. The studies showing beneficial effects of whey protein and casein supplementation have used 20g (e.g. this one by Kevin Tipton). Furthermore digestion rate might be different according to the type of protein assumed. The data above are from the study of Dangin et al. 2000. Postprandial leucine balance over 420 min after meal ingestion. Between AA and CAS meals (left) and between WP and RPT-WP meals (right), protein digestion rates were different (fast or slow), but amino acid profiles were identical. Last but not least, excessive protein consumption causes metabolic acidosis (e.g. here) and this is the reason why we used large amounts of protein supplementation in one of our studies to induce urinary calciuria and metabolic acidosis. So, if you are consuming too much protein not only you are connecting your bank account to the sea, but also compromising bone metabolism. A pint of whole milk costs 49p in a supermarket in the UK (as you can see on a price comparisons website). Most of all, it is unlikely to be contaminated with banned substances. 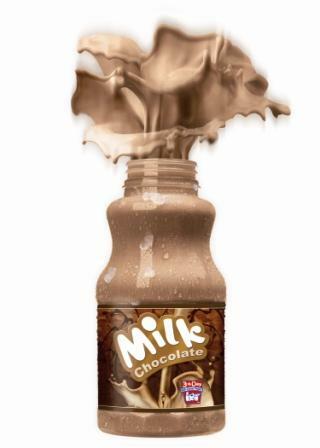 Chocholate Milk or fruit base milk is also easily accessible and slightly more expensive. The one below is £ 1.30 for 1L. As someone who likes basics, I have always been a great advocate of diet and real food first and supplements only to “supplement” specific needs. In this particular case, it seems clear that milk and milk-based drinks could be effectively used as post-workout solutions to maximise anabolic responses, facilitate fluid replacement and aid recovery. Of course they can be effective only if the athlete is not lactose intolerant. However ,considering the cost effectiveness, the quality in taste, the reduced risks of contamination as well as the reduced hygiene risks (large tubs of protein powders/mixers and bottles sometimes present some hygiene challenges with athletes…. ), I believe it is worthwhile suggesting the use of milk as a post exercise drink. For sure the effects can be beneficial to recovery and performance. I am sure in some cases there is a place for protein supplements, however as the word “supplement” indicate it should be intended to supplement the diet and provide nutrients that may be missing or may not be consumed in sufficient quantities in a person’s diet. Let’s fix the diet first and then think about supplements if needed.